How might it be possible to square the circle? The UK Government’s stated objectives include independence with regard to trade policy, regulatory policy and migration, as well as no hard border in Ireland. The latter is also a condition for the EU. In addition, the UK government seeks to maintain as much access to the Single Market as possible, while leaving the Single Market. These conditions cannot all be reconciled. All EU agreements are different and hence by definition bespoke. This will also be true of a future UK-EU agreement. The issues are over what is to be included and excluded, and how many of the above conditions the UK government will be forced to drop and/or relax. There is a real and manifest difference in the desirability of the UK remaining part of the current EU Customs Union, and signing a new comprehensive customs union with the EU. The latter option is far less desirable unless it has equivalent effect bilaterally. A key issue is the border between Ireland and Northern Ireland. Any option that involves a free trade area (to allow for independent trade policy) would necessitate customs and border controls which implies a hard border. A customs union with the EU partly resolves the issue of tariffs and rules of origin but would not solve the issue of monitoring of regulations and conformity assessment, nor the movement of people. If either tariffs or regulations differ between the UK and EU practically it is very hard to see how technological solutions could allow for no border infrastructure. Even if there were such solutions, with all the political goodwill in the world non-compliance and illegal trafficking would need to be curtailed via effective non-border monitoring and appropriate punishment procedures. This would be expensive, complex, and agreement / coordination with the EU may be difficult to achieve. The best outcomes economically are those that keep the UK as a part of the EU Customs Union or equivalent, and to remain in the Single Market, or as close to the Single Market as possible. Unless the UK government drops one or more of its conditions any of the possible variants of the preceding seem practically unachievable. On the current path, therefore, the likelihood is a fairly shallow free trade agreement with the EU, with limited liberalisation of services and the introduction of a hard border in Ireland. What is striking from this table is how little, in many ways, the discussion has moved on since then. Two significant extensions have occurred. The first concerns the issue of the compatibility or not of the different UK-EU Brexit options, with the border between the Republic of Ireland and Northern Ireland. Here it is worth recalling some of the key commitments in the December 2017 agreement between the EU and the UK. This committed the UK both to no hard border between Ireland and Northern Ireland; to preserving Northern Ireland’s place within the UK’s internal market; and in the absence of an agreement with the EU, to the full alignment of the UK to “those rules of the Internal Market and the Customs Union which, now or in the future, support North-South cooperation, the all-island economy and the protection of the 1998 Agreement”. The key issue then is the extent to which the different options regarding future UK-EU trade relations could be compatible with having no hard border between Ireland and Northern Ireland. This constraint has become much more explicit than was the case fifteen months ago. The second issue concerns the subtleties of the difference between being in “the” EU Customs Union, in comparison to being in “a” customs union with the EU. While it might appear a small difference, in practice the differences may be substantial. The aim of this briefing paper is to consider what difference these developments make, to examine under what circumstances might the UK governments current position on future arrangements with the EU be possible (or not), and to offer some recommendations and reflections for the way forward. The UK is leaving the EU Customs Union, because of a desire to have an independent trade policy. The UK is leaving the Single Market, because of a desire to have independence with regard to both regulatory policy and migration. The economic integrity of the UK is to be maintained, and there is to be no hard border in Ireland because of a commitment to the Good Friday agreement. The UK wishes to have as much access as possible to the Single Market because it recognises its importance to UK businesses. 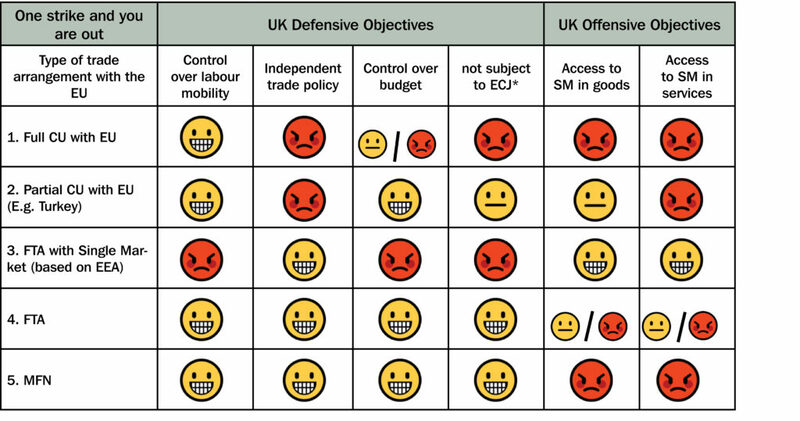 Note that points (1) and (2) are UK government red lines (conditions); point (3) is a joint UK-EU condition. Any agreement should in principle therefore at a minimum satisfy each of these. Point (4) should be seen more as aspirational from the point of view of the UK, since the EU is making it clear that full Single Market access would not be possible as this would constitute UK cherry picking (i.e. there can be no Single Market access without the four freedoms including labour mobility). What is much less clear is what sort of arrangement the government is actually seeking with the EU, what sort of arrangement with the EU might actually be negotiable (and clearly the two do not necessarily align), and whether what is sought and negotiated is compatible with all of the four points above. Various options have been recently aired with some (such as Martin Wolf in the Financial Times) suggesting that something along the lines of the Canada option is most likely, others suggesting an arrangement closer to that which Norway has. Each of these would involve a Free Trade Agreement. In (part) contrast the Institute of Directors recently suggested a partial, manufactured goods only, Customs Union with the EU should be sought, and this week the Labour Party also announced that it favours signing a full Customs Union with the EU. Others such as the Policy Exchange and the European Research Group incline strongly towards unilateral free trade, and complete regulatory freedom. Whatever the UK government ends up negotiating with the EU, it will want something ‘bespoke’, i.e. some form of arrangement that is different to that which the EU currently has with any of its existing partner countries. The message from Brussels is pretty firmly that the UK cannot have ‘its cake and eat it’ and hence the UK should not expect much by way of bespoke concessions. To some extent, this is an inevitable negotiating tactic. However, it is important to recognise that all Free Trade Agreements that the EU has signed are different because the balance of concessions is different depending on the partner you are negotiating with. Hence, by definition all trade agreements are bespoke. The question is the extent to which the EU will grant the UK a bespoke deal in serious and substantive ways. The UK should not invest too much hope in this as the EU has made it abundantly clear that cherry-picking bits of the Single Market will not be possible – hence the dismissal of the three baskets approach. It is worth thinking through some of these possible arrangements, their feasibility, the degree of tailoring they imply, and the extent to which they can be reconciled with all of the points (1) to (4). Reconciliation rapidly becomes problematic. One of the key problem areas which has received lots of political attention but less technical attention is the border issue in Ireland. It is worth recalling some basics here, and in particular why, and where trade is concerned, a border is needed. There are two principal reasons. First, if your tariffs are different to your trading partner, secondly if your regulations and standards and /or if your conformity assessment procedures for those regulations are different. In light of this, consider the Canada option – this would involve some form of free trade area in goods (possibly with some exceptions, as for example there were for agriculture in the EU-Canada agreement), and some degree of liberalisation of services and investment. A free trade area by definition involves countries having (at least the possibility of) different tariffs and this would satisfy condition (1) above regarding independence of trade policy. However, this requires customs controls and border checks, which contravenes condition (3) above. In addition, if UK regulations diverge from those of the EU (in order to satisfy condition (2) above), and if there is no agreement on mutual recognition of conformity assessment, then border controls are also needed to ensure that only goods which conform to the right standards can be sold in each other’s markets. This would appear to suggest that any option which involved a free trade area cannot simultaneously reconcile conditions (1) and (2) with condition (3) which is no hard border in Northern Ireland. The first route to consider is whether there are alternative existing types of trade agreements and ways of managing trade which enable all four conditions to be met. There are none. The commonly expressed view that a customs union with the EU meets this need is mistaken. In a customs union, all members levy the same tariffs and hence no border controls for tariff-related purposes are needed. While this goes quite a long way to resolving the border issue, it does not solve the issue with regard to the monitoring of regulations and conformity assessment. Even in a full customs union, border controls between member states are needed, as was the case in the EU prior to the Single Market, and as is the case in all other customs unions. Note also that a customs union is, by definition, applicable only to goods trade. It does not cover trade in services. Having a customs union with the EU is also in contravention of condition (1) above, and on the face of it, currently unacceptable to the UK government. Indeed, the Institute of Directors’ suggestion of a partial customs union which covers manufactures and processed food is one attempt to square this particular circle. The idea is that the UK would retain sovereignty over tariffs with regard to agriculture and fishing, and hence goes some way to satisfying condition (1). This is an interesting proposal worth serious consideration. However, and leaving aside the UK political dimension, if there is any divergence in tariffs in any sectors then, in principle, customs controls are needed. Moreover, agricultural and food trade between Ireland and Northern Ireland is important – accounting for roughly 30% of trade in each direction in 2016. Neither is the issue of regulatory divergence resolved by a customs union nor a partial customs union. There is another issue surrounding the customs union option which is important to highlight, but which is often not understood. In leaving the EU the UK will have to leave the EU Customs Union, and some (such as the Labour Party) have proposed that then the UK signs a new customs union agreement with the EU, in part to address condition (3), and in part to avoid the additional costs and frictions arising from rules of origin requirements in a free trade area. However, even if the new customs union is just as comprehensive as the current EU Customs Union there is an important difference. Under the current arrangements, if the EU signs a free trade agreement (FTA) with, for example, Japan (which it is close to doing), that agreement applies bilaterally to all the EU countries. This means that all EU countries lower their tariffs on imports from Japan, and Japan lowers its tariffs on all exports from any EU country. Suppose, instead, the UK has a customs union with the EU, and the EU signs the same free trade agreement as before with Japan. The UK will be committed to lowering its tariffs on imports from Japan, but there is no commitment for Japan to lower its tariffs on UK exports. The UK would need to negotiate and sign a separate deal with Japan in order to get access to the Japanese market. Perhaps, not surprisingly given that it already has access to the UK market, Japan may be less inclined to sign such an agreement. The UK’s leverage power in any such agreement with Japan would then lie in any additional concessions it might be able to make with regard to services or other non-tariff barriers. Though depending on the nature of UK-EU arrangements the UK may well be constrained in what it could offer here. The same issue therefore applied to all the 38 existing Free Trade Agreements the EU currently has with 67 countries. If the UK leaves the EU Customs Union and signs “a” customs union with the EU, the UK will have left all the existing FTAs. The UK will be obliged to offer the same terms as the EU to these countries, but they will not be required to reciprocate. There is, therefore, a real and manifest difference in the desirability of the UK remaining part of the current EU Customs Union, and signing a new equally comprehensive customs union with the EU. The latter option is far less desirable. The approach announced by the Labour Party on this issue is (a) that the UK would aim to agree with the EU that the “UK would have a say” in future free trade agreements; and (b) that the new customs union would “do the work of the current customs union”. The extreme version of (a) is that neither party signs an FTA without the other party agreeing to this, so as to maintain the integrity of the EU Customs Union. It is hard to see why the EU would ever agree to this, though some form of consultation with the UK could be envisaged. The implication of (b) is that, unlike the case of Turkey, if the EU signed an FTA with a third country the provisions of that FTA would apply bilaterally to the UK. I suspect that this is something that could be negotiated, albeit with some difficulty, with the EU, but is by no means certain. The second way of approaching this is to consider the extent to which, within the gamut of existing types of trade agreements, it is possible to design procedures that substantially reduce or eliminate the incompatibilities between the stated conditions. What this boils down to is the extent to which it is possible to avoid a hard border even where countries have different tariffs and/or where countries have different regulations or procedures for conformity assessment? This is where the UK government appears to hope it can offer ‘specific solutions to address the unique circumstances of the island of Ireland’. Is it conceivable to ‘test’ such a set of arrangement for the specific case of the Irish border? Clearly, this is a route which the Government is exploring, which is why we see repeated references to ‘special customs arrangement’ and to ‘technological solutions’. Many dismiss this as fanciful and magical thinking, but it is worth examining more carefully. The first question is: is it possible to have no border checks with the UK and the EU having different tariffs? Here the real problem is not with firms that comply but those that do not. For firms that comply, with a lot of political goodwill and with serious investment in procedures and infrastructure there probably are ways of doing this behind the border. Customs declarations could, in principle, be made electronically with amendments / improvements to existing systems such as Customs Freight Simplified Procedures (CFSP), Authorised Economic Operators (AEOs), possibly with some self-certification by firms etc., and with some de minimis exceptions for low-value trade. However, it would extremely challenging and may be particularly so for agricultural products and livestock. Whilst it has never been done before, it is probably not inconceivable technically. Even the oft-quoted European Parliament report which supposedly provides a solution to no border talks about the need for “gates” at the border, and “free movement lanes at major border crossings”. There is, of course, the additional non-trivial issue of whether, even if technically possible, it can be done within a two-year time period. The really tricky problem is with firms that do not comply, i.e. how to police illegal trade. Illegal behaviour can be stopped in two ways – monitoring / enforcement, and punishment. Having border controls is an example of monitoring and enforcement. If you check every consignment you have the ability to stop the ones that are not allowed. As you move away from this to only occasional checks on a risk assessment basis you need harder punishment mechanisms. Managing a border entirely with no border checks, and with behind the border spot checks is currently unheard of, and would require highly effective non-border monitoring and appropriate punishment mechanisms. It would be riskier, and more expensive because of the checks and procedures being more geographically dispersed. With regard to punishment, this raises two questions. First, what is the appropriate punishment? Clearly, this would depend on the nature of the transgression as there is a difference in severity between smuggling armaments, to falsifying documents to avoid paying a tariff, to not showing conformity with standards. What is important, however, is that for this to be possible, in the agreement between the UK and the EU it would be desirable to have agreement (alignment?) on these punishment mechanisms. Too much divergence in punishment mechanisms is likely to create asymmetries in the incentives to transgress. Those asymmetries could be addressed by different levels of monitoring and enforcement, but the greater the divergence the harder this becomes. Second, there is the issue of who is to be penalised in the event of a transgression – the exporter or the importer? For most customs transactions it is currently the importer, though that may depend on the nature of the transgression and the form of the contract between the exporter and the importer. Suppose the UK has a FTA with the EU and also signs a free trade agreement with the US. Suppose an American good is exported via a Northern Irish distributer as a “UK” good to Ireland and is then shipped on to the EU so (incorrectly) no tariff is paid. Here, either the Northern Irish based distributor could have knowingly incorrectly sold the good as a UK good, or the importer could have knowingly sold the good in the EU incorrectly. Logically in the former case, it is the Northern Irish distributor that has committed the offence, in the latter, it is the final seller. Legally, however, the offence will (a) only occur once the good has crossed the border and (b) under current international law in most circumstances it is probably the importer who will have transgressed and would be liable, though potentially they could sue the Northern Irish distributor. The problem, therefore, is that having differential tariffs with no border increases the transgression incentives for parties both sides of the border, yet currently, liability is largely with the importer. This is unsatisfactory if nothing else because if the burden of risk falls on the importer they may either choose a different source of supply or require a higher markup (lower price) in order to take on the risk, or need to take out additional insurance cover which raises their costs. This issue would need to be addressed in any agreement between the UK and the EU. Even if there was the political will to go down this route, this would also be charting completely new territory, hence any negotiations, especially given different legal systems with no joint ultimate arbitration such as the European Court of Justice (ECJ) are likely to be exceedingly complex, lengthy and liable to fail. Although I suspect this forms part of current Government thinking, it really is very hard to see that this is feasible. It is also important to note that even technological solutions do not obviate the needs for any form of physical infrastructure at/near/behind the border (e.g. cameras or drones or whatever may be proposed need to be located somewhere). A similar question can be asked with regard to no border and regulatory differences where differences in standards can give firms a perceived competitive advantage, and also, for example, raise issues of consumer protection. The issue is can country A sell a good in country B which has been produced to a different standard to that in country B? Unless there is some agreement on mutual recognition of standards if country A wishes to sell in country B, the good being sold in country B must meet the standards of country B. Even if country A does meet the standard, the product will need to be checked on entry into country B unless there is mutual recognition of conformity assessment. Hence agreeing on standards (either via harmonisation or mutual recognition) and then agreeing on mutual recognition of conformity assessment is central to reducing the costs of trade between countries. It would also appear central to any hope of not needing a physical border. Current EU policy is that it will only sign an agreement on conformity assessment (ACAA) where there is full alignment with the EU’s standards. Specifically, “An ACAA requires the prior full alignment of the partner country’s legal framework with EU legislation and standards and the upgrading of the implementing infrastructure in line with the model of the EU system, in relation to standardisation, accreditation, conformity assessment”. However, ‘full-alignment’ is in contravention of condition (2), and therefore currently appears very hard for the UK Government to agree to. It is perhaps conceivable that some form of fudge might just be possible. That is, as long as the UK exercised its sovereignty and “chose” to fully align itself with all EU standards, mutual recognition of conformity assessment could be achieved. Then, in the spirit of ‘managed divergence,’ there may be some very limited scope for the UK to diverge in certain areas – with some punishment mechanisms – but which largely preserves market access. For example, Norway has refused to implement the EU’s postal directive and in consequence, and is being threatened with EU sanctions. But the degree of managed divergence is likely to be only face-saving, and would probably require some longer-term political commitment to alignment, with punishment mechanisms if breached. This might enable the UK government to argue that they had achieved (some degree) of regulatory independence and meet condition (4). But practically, this will be extremely difficult politically for both sides. For the UK, because of opposition from the hard Brexiteers, and for the EU because it is likely to be seen as cherry picking, or having one’s cake and eating it. It is for this reason that the EU has poured very cold water on the three baskets approach. However, even if the UK and the EU did manage to sign an ACAA it is still necessary to monitor that the goods crossing borders can do so legitimately, i.e. that they conform, and therefore it is hard to see how this can be made consistent with condition (3). As with tariffs, it is probably possible to find non-border solutions for the monitoring of conformity assessment for firms that do comply. But as before, the real issue is with the firms that do not comply, how to monitor/enforce, and what the appropriate punishment structure is given asymmetrical incentives to transgress in a world of two different legal systems. So (and taking a very, very deep breath) it is probably not completely impossible that the UK could sign a Free Trade Agreement with the EU, where the UK agrees a process of (managed) convergence (a.k.a very superficial divergence) on Single Market regulations and which results in no hard border in Ireland. But to achieve this requires a massive leap of faith politically between the UK and the EU, a considerable leap of imagination with regard to the management of the border between Ireland and Northern Ireland, and a leap in the dark procedurally and technically. While I suspect this is the direction the UK Government (to the extent that it can be given a single identity) hopes it is travelling, it is very unlikely to happen, and very hard to see why the EU would agree to this. Note that all the preceding issues with regard to Single Market regulations and access equally apply in the case of a full or partial customs union between the UK and the EU. One advantage of a customs union option, however, is that it may resolve the issues around tariffs, differential tariffs between countries and rules of origin requirements. Arguably, the leap of imagination that is required to resolve all of the conditions outlined at the start of this piece becomes smaller, and perhaps slightly more realisable. Even more so if the customs union option on the table is membership of the current EU Customs Union, or a new and equivalent customs union, as opposed to a partial or non-equivalent customs union between the UK and the EU. The preceding is extremely unlikely. It is therefore very hard to avoid the conclusion that some form of hard border, however, this is presented looks inevitable, and that this particular circle cannot be squared. Let us not forget that all of these outcomes lead to economic losses for the UK, for Ireland, and to an even lesser degree the rest of the EU. In the absence of a suitable trade agreement with the UK, and in the absence of an acceptable technological solution, the European Commission’s proposed Draft Withdrawal Agreement (published on 28/2/2018) states that: “A common regulatory area comprising the Union and the United Kingdom in respect of Northern Ireland is hereby established. The common regulatory area shall constitute an area without internal borders in which the free movement of goods is ensured and North-South cooperation protected in accordance with this Chapter” (Ch.3, Art.III); and that “Customs duties on imports and exports, and any charges having equivalent effect, shall be prohibited between the Union and the United Kingdom in respect of Northern Ireland” (Ch.3, Art.IV). This is clearly one solution to the issue of the hard border between Ireland and Northern Ireland. However, this will be completely unacceptable to the UK government: unless the UK violates conditions (1) and (2) above, the European Commission proposal violates the first part of condition (3) as it fails to maintain the economic integrity of the United Kingdom. means that that option cannot ‘square the circle’ and meet all the UK Government’s constraints and objectives. The best outcome for the UK economically, or rather the least worst outcome, is to remain part of the EU Customs Union for trade in goods (even though this appears impossible), and stay in the Single Market (Row 1 above). Of course, this contravenes (1) and (2) and is not acceptable to the current government. The next best option would be to remain part of the EU Customs Union (or to sign a customs union with equivalent effect) for goods, and while leaving the Single Market to remain as closely aligned to it as possible (Row 2 above). Here the EU has made it clear that the UK cannot have its cake and eat it, so full alignment will not be possible. We should start with the closest possible alignment to the Single Market that the negotiations would allow, but where priority is given to those areas that validate not having a hard border between the Republic of Ireland and Northern Ireland. On this issue, the UK Government will need to establish as early as possible (a) whether the EU would countenance such an approach and (b) whether the EU is at all open to discussions regarding behind the border monitoring and enforcement of the aligned rules. This outcome meets conditions (2), (3) and (4), but does not satisfy condition (1) and therefore is extremely unlikely to be politically acceptable to the UK Government. It is probably equally so for the EU with regard to very high levels of alignment. An alternative, therefore, is an arrangement which is much closer to the current Norway (EEA) arrangements, than CETA++. 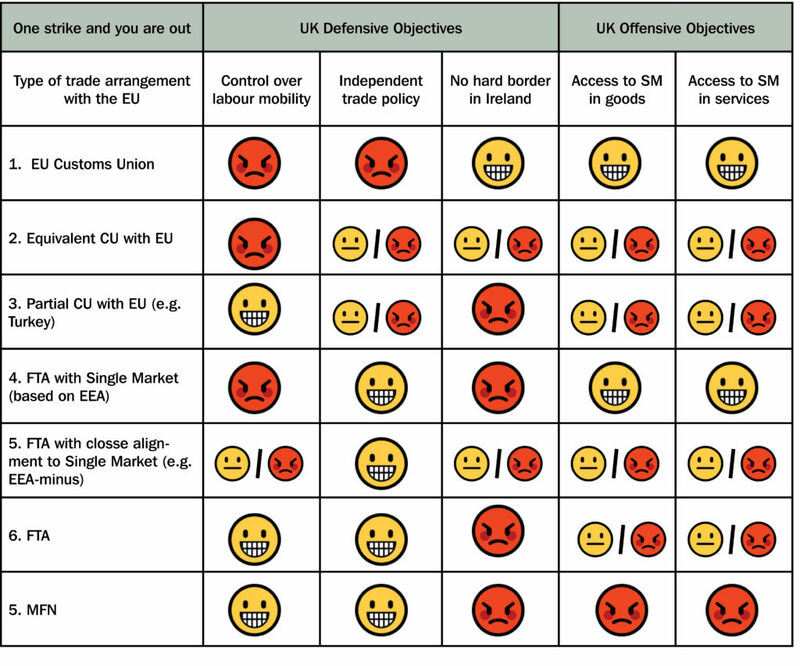 This alternative assumes that the UK is not a member of the Single Market but that it can negotiate as close an alignment as possible to the Single Market (Row 5 above). Think of this as EEA-minus. However, this should only be pursued if the UK Government has assured itself technically and technologically that it has a coherent plan for behind the border management of trade (with respect to tariffs and regulations) between Ireland and Northern Ireland. If it has a coherent plan for this (which currently does not seem to be the case), that coherent plan would need to be discussed at a very early stage with the EU, and should only be considered if there is clear evidence that the EU would even begin to countenance such a solution. While this is hard to conceive, this does not mean it should not be considered; it might just mean you do not consider it for very long. This outcome meets all four of the conditions but is highly unrealistic and extremely improbable. This is probably not magical thinking, but almost certainly fanciful. All the preceding appear politically impossible – either for the UK or for the EU. The next best alternative would be a new customs union with the EU which does not have ‘equivalent effect’ along the lines of EU-Turkey (Row 3 above). This should be as comprehensive as possible while managing domestic political constraints. The Institute of Director’s paper on this is one possible way forward. As with the first option, this should come with the closest possible alignment to the Single Market that negotiations would allow. This outcome largely contravenes condition (1), and does not meet condition (3), but might give semblance to this, and to conditions (2) and (4). Squaring the circle in any of the above ways requires a leap of faith, a leap of imagination and a leap in the dark. 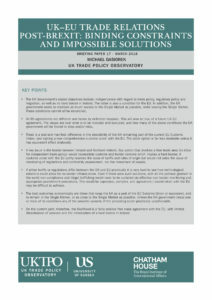 Each of these leaps is unlikely to be achieved, and as we argued in 2016, the most likely outcome is that we see a much shallower Free Trade Agreement which will be very similar to the existing Canada agreement, and that there will be no satisfactory agreement on the behind the border treatment of trade between Ireland and Northern Ireland (Row 5 above). The Government will have ‘succeeded’ in meeting condition (1) and (2), but the agreement will not satisfy conditions (3) and (4). Economically this would be the worst out of these outcomes for the UK. And failing that the risk of a leap of the cliff-edge (Row 6) remains high. The current set of the UK government’s overlapping conditions or constraints cannot be reconciled. The solution space appears to be null. The only way of resolving this is to drop and/or relax at least one or more of the conditions. Article 49 of the December Agreement between the UK government and the EU. European Commission The implementation of EU products rules 2016 (Text with EEA relevance) (2016/ OJ C 272/01).